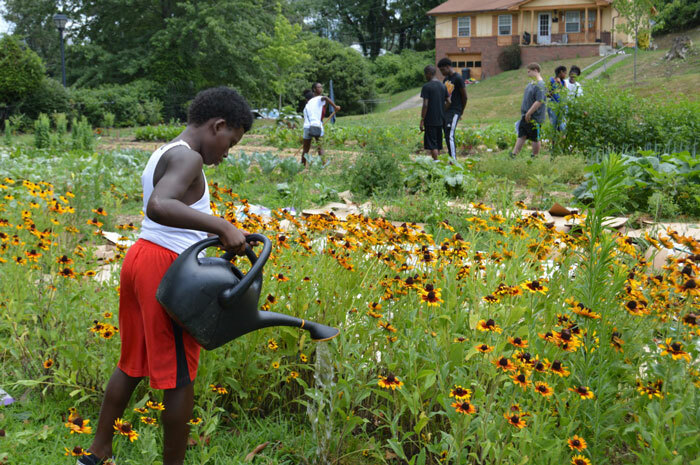 This fall, Green Opportunities was one of 23 organizations from across the U.S. to receive a $200,000 two-year grant as part of The Kresge Foundation’s initiative, Fresh, Local & Equitable, which supports neighborhood-scale projects leveraging healthy food and creative placemaking for equitable economic development. After being selected to participate in FreshLo in 2016, GO, in partnership with the Southside Community Gardeners and Southside residents, completed a one-year planning phase for the Southside Arts & Agricultural Center. During the past year, the coalition hosted workshops and garden parties in the Southside Community Garden, introduced a grab-and-go food cooler stocked with free, healthy snacks to the Edington Center and strengthened relationships with community-based arts organizations, including Word on the Street and Asheville Writers in the Schools and Community. The purpose of the Southside Arts & Agricultural Center project is to support healing, restoring and reclaiming community culture; support emerging leaders; grow food; and incubate economic development. The center will celebrate black culture, creativity, arts and agriculture. Specifically, this grant will provide funding for the Southside Community Garden as well as the renovation of the auditorium in the Arthur R. Edington Education and Career Center. The Asheville Housing Authority will raise the remaining funds required for the auditorium renovation.